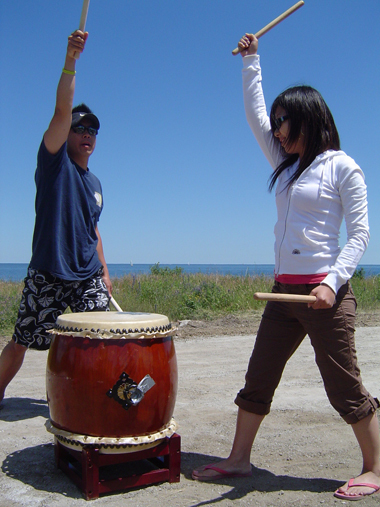 Taiko is a great way to get in shape — proper taiko playing strengthens and tones leg, core, and upper body muscles while increasing balance and stamina. 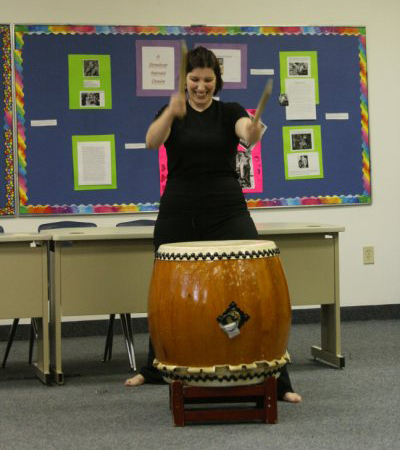 It is also a great stress relief — nothing like beating a drum with all your strength after a hard day’s work! Lastly, it is tons of fun! The class sizes are small, allowing you to work at your own pace. In the lessons, we will introduce you to the drums, teach you basic techniques, rhythms, and a song or two! We are currently looking for new members to join our group. Doesn't matter if you are experienced or a novice, what we really want are people with enthusiasm and energy. If this is you, let us know. We would be especially interested in hearing from you if you have experience playing the flute or Japanese fue as our current fue player is moving to Japan! As a member you must commit to at least a 2 hour practice a week and have a positive attitude. All members pay an up-front fee that is used 100% towards the maintenance of drums, equipment, and uniforms, and the practice space rental. We are a not-for-profit group. As a member you get to perform with the group, participate in all practices and social events, and learn and create songs.